Hi-ya! 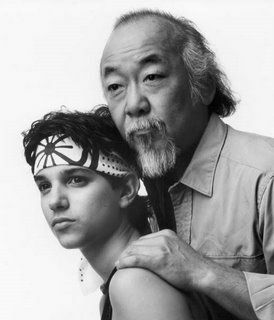 I harness my inner Mr. Miyagi. Wax on, wax off. I definitely feel worthy of wrapping a bandana around my forehead. I have achieved a belt in karate! Sweet success! Wait a second, that’s the wrong kind of belt. This wasn’t karate at all. I earned my Lean Six Sigma Green Belt last year. I do still want an actual green karate belt to hang on one of the walls of my office though; a framed certificate just doesn’t have quite the same pizazz as a karate belt. One of the many things I learned in this journey to achieve this certification is focusing on process. That went well with my already deep commitment and confidence in Theory Y management. In the 60s Douglas McGregor developed the X and Y management theory while at MIT School of Management. These theories are the bread and butter in management, organizational behavior, and human resources. At a very high level Theory X says employees are inherently lazy and do not like to work or achieve, Theory Y says employees are inherently good and want to work and achieve. The fusion of my Theory Y and Six Sigma certainties leads me to one conclusion: processes are the problem, not people. Holding or not holding to this opinion has very large implications. It is the puppet master of how you react professionally. Within an earshot at all times throughout my day you can hear the angry rumblings of people dogging each other. Because we are professionals this is obviously said while on mute or after the call is over, but none the less, still professionals blaming each other. This opens up some dangerous rabbit holes. Having the thought of another person or co-worker as being stupid, lazy, rude, etc. leads one to build walls and create barriers around themselves and take something professional personally. The personal and professional tango so much that at some points you cannot tell one from the other. It causes a constant frustration and a history and opinion to be formed against people. "Jane is this," or "John is that." No matter what they try to accomplish they are marginalized because of who they are, not what they are doing or trying to accomplish. Dead ends are easily reached going down these cognitive paths. Frustrations boil inside and carry into our homes as we personally hold something against someone in a professional environment. What if we made a switch? Why not poke and prod processes instead of people? By creating and maintaining the discipline of focusing on process we can relieve ourselves of unnecessary malice. We can free ourselves of such frustrations making room for more efficient and positive work. There have been studies done that show happier people live longer, healthier lives. The idea that you can separate work completely from home life is somewhat of a myth. We are given 24 hours in a day. If you are a healthily functioning individual then you spend 8 of this day working, 6-8 sleeping, which leave you about 10-8 hours where you are free and living your personal life. Work makes up 1/3 of your day. Being miserable one third of your day can have a huge impact on the little time that you are not working. You don’t sleep well, which causes you to not live well personally. You are frustrated at work and you bring it home and take it out on your spouse. There are plenty of reasons to shoot for the goal of not being miserable at work. So what makes work so miserable? Frustrations and stress. Each day has its own challenges, it is unrealistic to think you will not have stress or frustrations, however, you can manage the unavoidable frustrations or stress by not taking professional matters personally. If someone calls you requesting something absurd, instead of defaulting to thinking, “They are stupid,” maybe it would be healthier to try to understand why they make this request or to identify a need for training. Looking at someone’s behavior as only a product of their training or processes we can easily help us avoid falling into the personal offense trap. It’s professional, we all have a goal, we are all working towards something. We have different procedures and methods of attaining these goals. We all want to do well. We all want to achieve. The frustrations that come with work should be seen as systematic issues not personal ones. People are not the problem, processes may be. If we can buy into the ideology that people are good and want to achieve success on their own then we can truly change the morale at our work places. If we are positive and not tied into knots over things because we believe it is not the people, but the processes, we can influence the next guy and alter the face of the professional world. We can represent professionalism with a genuine smile instead of a professional smirk.